Melbourne Hall Gardens with its broad sweeps of lawn, avenues and unexpected vistas is one of the best known historical gardens in the country and is the best surviving early 18th century English garden in the manner of le Notre. It was laid out by Rt. Hon Thomas Coke, Vice Chamberlain to Queen Anne, with help from the garden landscape designers George London and Henry Wise in the formal style. It is noted for its long tunnel of Yew, its wrought iron pagoda created by Robert Bakewell and its statuary by Jan van Nost, notably the Four seasons monument, a gift from Queen Anne. 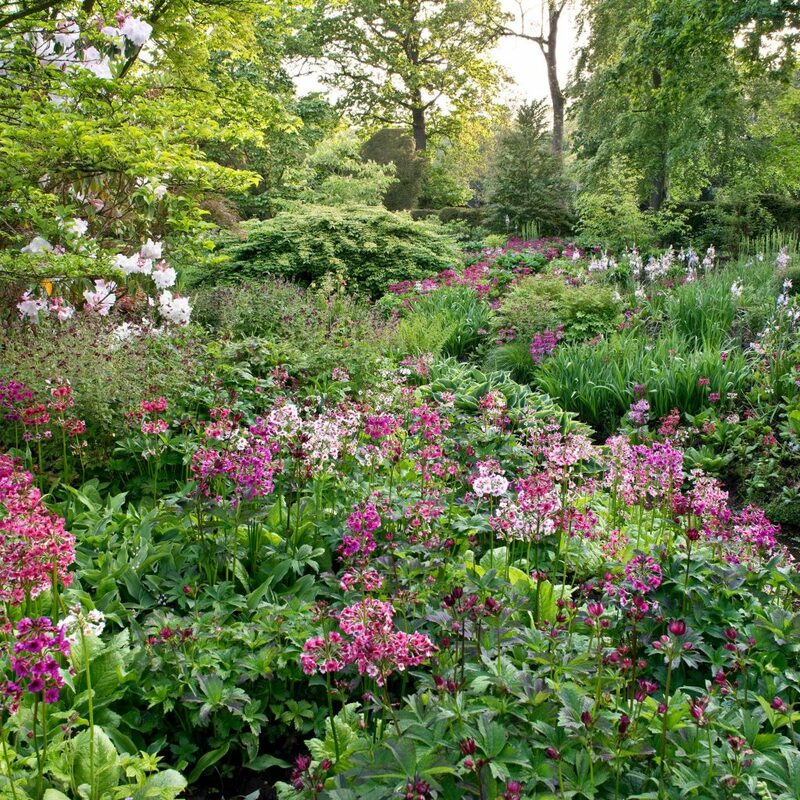 There have been few radical alterations to the gardens since the early 18th century. However, in the earlier part of t he 20th century, Lord Walter Kerr and his wife Lady Amabel carried out extensive restoration. Lord Ralph Kerr took over running the Melbourne estate in 1987. His wife Lady Ralph Kerr is a painter of both portraits and landscapes. Her passion for gardening has developed the garden at Melbourne in many ways. Her eye for colour and detail means that the Melbourne garden is a haven of delightful and unusual specimen trees, shrubs and herbaceous borders. 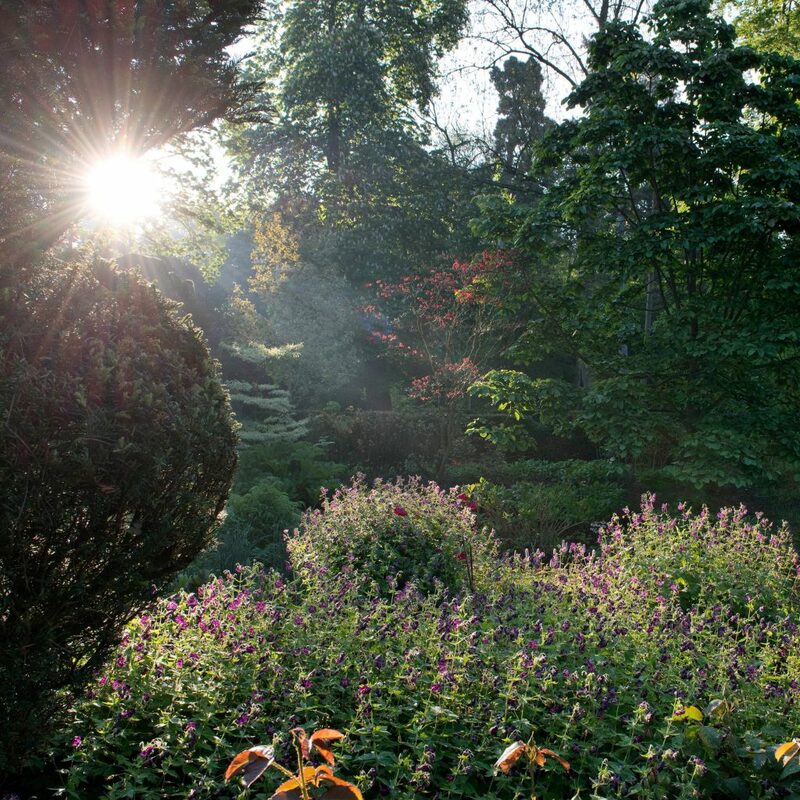 Although still very much an 18th century garden, the new planting schemes have introduced greater botanical interest. 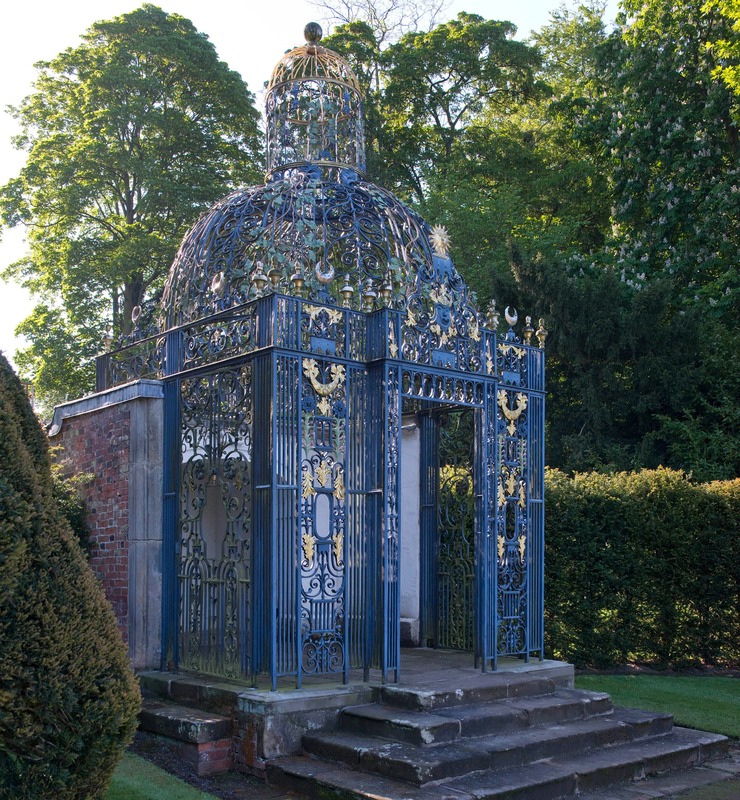 A major feature of the garden is the wrought iron arbour known as the ‘Birdcage’ which was made by the celebrated ironsmith Robert Bakewell in 1706-1708 for £120. It was made in the basement of ‘Stone House’, which still stands on the South side of the parish church. The arbour made Bakewell famous, but its manufacture left him penniless. In form, it is derived from wooden arbours common on French gardens. Bakewell went on to produce famous ironwork for many important buildings. Two other examples nearby are the chancel screens in Derby Cathedral and Staunton Harold Church. Lovely acers, mature trees, wonderful vistas and tasteful planting. Well worth a visit. Most enjoyable. The hexagonal Muniment room, with its intricate roof, is an important survival from the 17th century garden. Originally a dovecot, it was heightened and remodelled by Thomas Coke in 1708. This yew was originally trailed over a wooden framework. Originally just 100 yards long, ending with a fountain in a circle of clipped yews. It was extended 80 yards beyond the fountain, probably in Lord Melbourne’s time. …is written on a stone inside. Drinking this water is not recommended. The important lead statuary in the garden was supplied from Jan van Nost’s workshop in Piccadilly. The account for this is dated 1706 although some may have been supplied earlier. 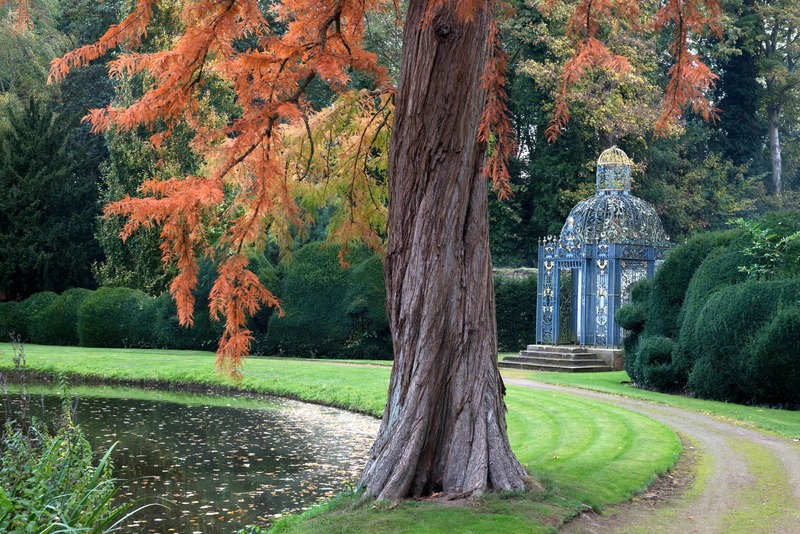 Perseus and Andromeda stand in the yew hedges to the East of the basin at the bottom of the garden. The ‘Vause’ is a large urn known as the ‘Four Seasons’, which was reputedly a gift from Queen Anne to her Vice Chamberlain Thomas Coke. This is the focal point of the South East part of the garden from which the avenues radiate. A major contributor to the garden at Melbourne was George Sorocold (born in 1668), a pioneer hydraulic engineer who constructed a piped water supply at Derby in 1692. At Melbourne, he was responsible for supplying water to the pools and fountains. He made the fountains work by using direct pressure from the mill pool, whose surface lies well above the level of the lower part of the garden. To give an extra head of water he raised the level of the pool by two feet, flooding part of the vicarage garden in the process.